These little chocolate delights called cookies are super easy to make and so tasty!! You can’t go wrong by choosing either the raspberry or orange version. A double batch could also be produced so you have an even amount of both to taste. 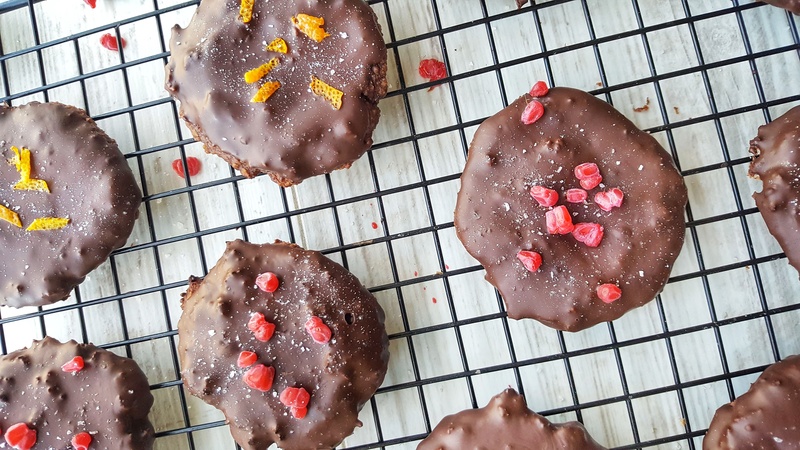 Initial inspiration for these cookies came from Chloe Harris of Foodie Cafe. If you don’t already follow her on social media – I would suggest doing so as she is always sharing recipe ideas, restaurant tips and she also caters retreats if you feel like a foodie getaway! Cover the dates with boiling water and allow to soften for 20 minutes. Place the ground almonds, 100g raspberries or the orange zest and juice, vanilla, cocoa and baking powder in a food processor or large tall jug if using a stick blender. Drain the softened dates and add to the mix. Blitz all the ingredients until a smooth paste is formed. Scrape down the sides and blitz again to ensure all combined. Stir through the chopped almonds. Preheat an oven to 200°C/180°C fan/400°F and line a baking tray with parchment. Remove the mix from the fridge and create 8 round cookie shapes on the baking tray with tablespoonfuls of the mix. Bake in the oven for 8-11 minutes until cooked through. Allow to slightly cool on the baking tray for a few minutes before removing and cooling fully on a wire rack. Dip one side of each cooled cookie into the chocolate, sprinkle over some sea-salt and the reserved raspberries. Store in an airtight container or in the fridge for up to 3 days.